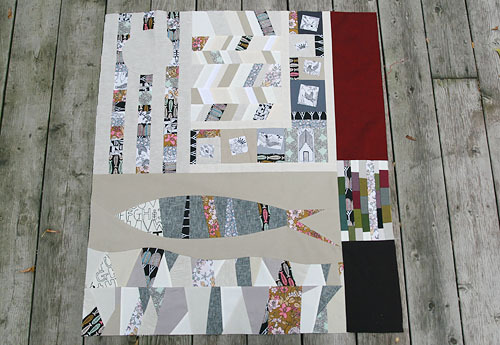 In the meantime, I thought I'd share the latest round of The Traveling Quilts. This month I had Heather's quilt. 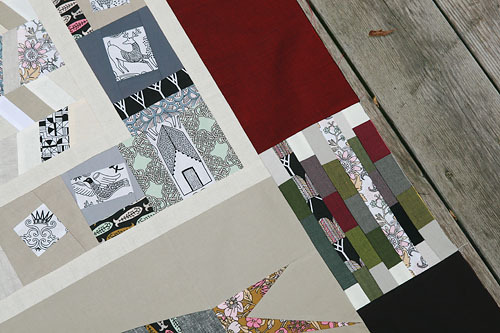 Her quilt featured a variety of neutrals and geometric shapes (herringbones and the like). I believe Penny added in the large fish. I decided to add a pop of color. My addition is the column on the right. Starting with a big chunk of a wine red Oakshott cotton, then some tiny strip columns of a combination of Oakshotts, a couple prints already in the quilt and neutrals. I finished the column with a deep chocolate brown Oakshott cotton. I hope you like what I added Heather! Ashley now has the quilt and I'm sure she's adding something really amazing.